There are a growing number of excellent places to eat and drink around Cardigan Bay. I don't claim to have tried all of them - yet, but here are some that I like and I'm sure you will find a favourite amongst them. I do not charge for this listing and if you have your own recomendation then please let me know. A floating box of glass and slate perched on the castle walls provides a great vantage point to view the gardens on one side and the high street and river on the other. The entrance is either through the castle or if you just want to visit the café use the door below the castle entrance and follow the stairs up. There are facilities for disabled visitors. Seating is available indoors and out. The salads and cakes are lovely! Opening times: Lunch 10am - 4pm Dinner from 6.30pm on Friday and Saturday nights Sunday Lunch - booking recommended. Excellent and very friendly restaurant with authentic Indian cuisine. Very extensive menu, don't miss out on the delicious Peshwari Naan bread. Bring your own alcohol, or choose from non alcoholic beer or soft drinks including a range of Lassi [yogurt, water, spices and sometimes fruit]. This popular Café with a stunning view over Aberystwyth town to the sea, offers a mouth-watering selection of freshly made salads, hot meals and snacks, plus plates full of homemade cakes! Hot lunches are served from 12 noon with vegetarian options always available. Breakfasts, Light lunches, speciality coffees and home made cakes. Artisan bread freshly baked on the premise. Relaxing and comfortable Tuesday to Saturday 10-5. Next door to Custom House on St. Mary's street ( turn down by shoe shop ) A great place to enjoy a good coffee and delicious food. Egon Ronay recommended Vegetarian Self Service Restaurant for lunch and light refreshments. The Coach House is a great friendly place for breakfast, a light lunch, or lovely afternoon tea. On sunny days, sitting outside with a great view of the abbey is a particularly relaxed experience. Fully licensed with selection of wines and locally brewed beers and ciders. Cafe and deli with freshly baked goodies. Great for a coffee or brunch. Closed Monday. Look out for evening openings on the website. The Daffodil gastro pub is situated in the village of Penrhiwllan near the market town of Newcastle Emlyn. The quality of the food and the imaginative presentation of dishes makes this a real treat. A deservedly popular cafe at the top of Cardigan high street a few doors before the turning down to The Mwldan. Great value for lunch and a comfy spot for morning coffee or afternoon tea. The sofas eat you up, the armchairs in the window are perfect for watching the lively high street. Try the cakes and you are sure to keep coming back. The Guardian December 19, 2009 50 Favourite Festive Pubs tells you all you need to know about this excellent restaurant - The Harbour Master. Malcolm Gluck, wine critic..."It takes dedication to get here, I recently returned from a weekend stay - it is also a hotel....Its secret? Owners Glyn and Menna Heulyn see it as an extension of their family. Indeed the place - and its chattering, pretension-loathing locals - are family. The beers (numerous) are local, the food is local, the staff are local and the weather local."... "Over my weekend I enjoyed a Gavi di Gavi, An Alsace gewurtztraminer, an Argentinian malbec, an albarino and a bottle of Chateau Batailley Grand Cru Pauillac 2004 (for a bargain £45)." Just across from Cardigan Castle, below The Grosvenor. Pass under the archway to discover Cardigan's hidden treat. Mostly outdoors, though some shelter under the tipi, this is a lovely spot to enjoy some low key music and delicious pizzas cooked on a wood fired oven and delicious fresh salad beside the Teifi. Perfect relaxing spot to enjoy a super sweet flapjack or chocolate brownie with your morning coffee. Closed in the winter. creative community space offering a range of craft activities, meeting and exhibition space with a café and coffee shop. A place where people can meet, eat, make and create. The Plwmp Tart is a little cafe housed in the old farm cart house just a few minutes walk from the glorious sandy beach of Penbryn. Serving light lunches, homemade cakes and pastries, great coffee and Welsh ice-cream. Friendly, relaxed atmosphere with all welcome ( including your four legged friends!) Open Easter - October and some dates out of season, check the Facebook page for more info. 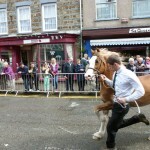 Look out for festivals around Cardigan Bay, especially the food festivals! 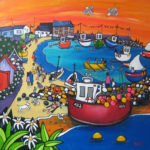 Exhibition of work by popular local artist in the centre of Cardigan. Celebrating the bi-centenary of the first emigration from the Teifi valley to Canada in 1819. Cardigan Town will be going maritime over Easter. Starting with an opening ceremony on Prince Charles Quay on 13th April, events will run over ten days and include exhibitions, talks, town tours, singing, demonstrations of coracle fishing and more. 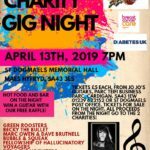 We have decided to have our own charity gig night, sponsored by Jo Jo's Guitars at St Dogmaels Memorial Hall. Poster below. Lots of fantastic bands on the night and a great comedian to compare the event. 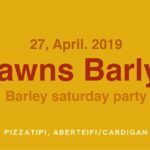 There will be a free raffle, including a free guitar from Jo Jo's guitars for one lucky person, guitar lesson, CD's, a free breakfast from the Cellar Bar in Cardigan and more. Hot food on the night (£5 per plate), meat or vegetable chilli and a very reasonable bar for all your drinks. Tickets can be purchased from Jo Jo's guitars, Parc House, Parc Teifi Business Parc, Cardigan. SA43 1EW telephone number: 01239 622152. Tickets will also be available from St Dogmaels Village post office and for sale on the night. All proceeds from the night will go to our 2 chosen charities Breast Cancer Care and Diabetes UK. It should be a fantastic night! 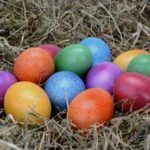 Starting Wednesday afternoon and then again over the Easter weekend and finishing on the following Wednesday, we have six fabulous days of crafts: card making, masks, windmills, sheep magnets, painting egg cups and much, much more! Also try and find all the clues on the Easter Bunny Trail and win a prize! Come and spend some time at the wonderful treasure. The Attic Players present 'The Thrill of Love' by Amanda Whittington. 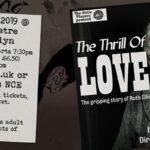 This is the true story of Ruth Ellis and her tragic descent into despair, culminating in the shooting of her lover David Blakely in April 1955. Ruth Ellis was found guilty of murder, and was hanged on July 13th 1955, the last woman to be executed in Britain. The cast and crew have studied a huge amount of information about the case, alongside the script, which is particularly stylised and departs from convention, and have worked hard to give our audience an authentic perspective of the period as well as the facts. We hope that our production will encourage some thoughtful insight into what was a tragedy at the time, and still causes debate today. (doors open at 7) PLEASE NOTE: This production contains adult themes and short moments of flashing lights. 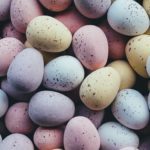 Hop along to Cilgerran Castle this Easter and participate in the Easter Egg Hunt in association with the National Trust Come and eggsplore Cilgerran Castle and complete our Easter trail to claim you Cadbury's Easter Egg. £2.00 per trail. 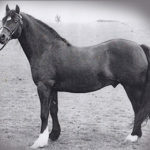 58th Annual Show A Welsh Pony and Cob Society Silver Medal and rosette will be awarded to the overall Champion in each Section. Visit the website for the 2019 schedule. National Dance Company Wales presents AWAKENING Three Unique dances to amuse and amaze. Choreography by: Fernando Melo, Caroline Finn and Marcos Morau. AFTERIMAGE A journey of fleeting images; of appearance and disappearance. Mirrors are used on stage to form a unique theatrical experience where the past and the present collide with a poetic & creative style of dance. REVELLERS’ MASS Delve into a world of ritual as an unlikely group gathers for a dinner party, where etiquette is put to the test. Curious choreography and characters are inspired by historical paintings. TUNDRA Tundra tears pages from the Russian history books on folk dance, mass parades and revolution, revitalising old ideas with renewed meaning. It’s as mesmerizingly beautiful as it is robotically precise. Sam Sweeney - The Unfinished Violin, Violin music inspired by a truly incredible story…as seen on BBC Breakfast & Antiques Roadshow. Inspired by his violin, carved but never finished by Richard Howard in 1915, Sam Sweeney has created a live show and album of instrumental music inspired by the Great War Sam Sweeney signed with Island Records to release his first solo album, The Unfinished Violin last November, an expansion and development of his acclaimed live show, Sam Sweeney’s Fiddle: Made In The Great War, which toured to great acclaim from 2014 to 2017. The show centred on a fiddle the 19-year-old Sweeney came across in violin maker Roger Claridge’s shop in Oxford, made but not assembled by one Richard S Howard of Harehills, Leeds, in 1915. Claridge had come by it at auction, in pieces, in an old manilla envelope, and put it together and put it on sale. It’s the instrument Sweeney has used for numerous albums and countless gigs, and in time he set about digging into its history, and uncovered the fateful tale of Richard Howard, a music hall performer called up in 1916 to the Duke of Wellington’s West Riding Regiment to fight and lose his life in the Battle of Messines on 7th June 1917. Following Sam’s appearance on Radio Four, to talk about Made In The Great War. Island Records subsequently invited Sam to create an album of the kind of music Richard Howard’s violin would have played had it been assembled at the time of its making. Come and meet our band of Pilgrims! They'll tell you about their travels and show you how they make their living. Weary after their long journey, they will set up their tents inside the Abbey and explain what they did as a job before they became Pilgrims. A fun and interesting day for the family. A celebration of cycling in Mid Wales, including town centre criterium racing, downhill mountain biking and a mass participation ride - the Continental Welsh Wild West Sportive, covering all the best roads in Ceredigion. 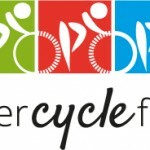 Aberystwyth Cycle Festival also includes fringe events all week and of course brings you the thrills of town centre cycle races all afternoon and evening on the 26th May. With some of Britain’s top cyclists making a rare appearance in Mid Wales, festival visitors can watch all the on & off road action and also experience the beautiful and undiscovered lanes of Ceredigion on their own bikes. 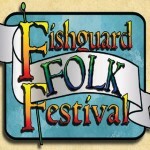 The festival takes place in a wide range of venues from the town square to the Yacht Club in Fishguard old town. Featuring this year are; Jim Moray, The Melrose Quartet, The Trials Of Cato, Andy Cutting, Miranda Sykes, Alaw, Hannah James, plus many more. There will be 4 fee-paying concerts at Theatr Gwaun, but the rest of the festival is FREE, with about 30 concert, dances, workshops and sessions.